Umberto Boccioni, self-portrait, March 1913 (detail). Photograph. Calmarini Collection, Milan. Umberto Boccioni was born on October 19, 1882, in Reggio Calabria, Italy. In 1901 he went to Rome, where he studied design with a sign painter and attended the Scuola Libera del Nudo at the Accademia di Belle Arti. In Rome he and Gino Severini learned the techniques of divisionist painting from Giacomo Balla. Boccioni traveled in 1902 to Paris, where he studied Impressionist and Post-Impressionist painting. He participated in the Mostra dei rifiutati in 1905 and in the Esposizione di belle arti in 1906, both in Rome. Following a trip to Russia in 1906, Boccioni visited Padua and then moved to Venice, where he spent the winter of 1906–07 taking life-drawing classes at the Accademia di Belle Arti. In 1907 he settled in Milan. In 1909–10 Boccioni began to frequent the Famiglia Artistica, a Milanese artists' society that sponsored annual exhibitions. During this period he associated with Carlo Carrá and Luigi Russolo, and met the poet Filippo Tommaso Marinetti, who had published the first Futurist manifesto in February of 1909. In 1910 Boccioni participated in the formulation of the two Futurist manifestos Manifesto dei pittori futuristi and Manifesto tecnico della pittura futurista. He, Carrà, Russolo, and Severini signed the first, and were joined by Balla in signing the second. That same year Boccioni's first solo exhibition was held at the Galleria Ca' Pesaro in Venice. In the fall of 1911 the artist went to Paris, where he met Pablo Picasso and Guillaume Apollinaire through Severini. 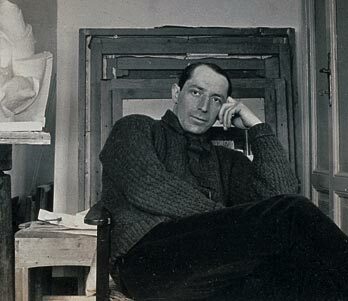 Boccioni's paintings were shown with those of Carrà, Russolo, and Severini in the first Futurist show in Paris, at the Galerie Bernheim-Jeune in 1912. The exhibition then traveled to London, Berlin, and Brussels. In 1912 Boccioni began concentrating on sculpture, and his Manifesto tecnico della scultura futurista was published. From 1912 to 1914 he contributed articles to the Futurist publication Lacerba. In 1913 the artist showed sculpture and paintings in a solo show at the Galerie de la Boétie in Paris, and his sculpture was included in the inaugural exhibition of the Galleria Futurista Permanente in Rome. His book Pittura e scultura futuriste (dinamismo plastico) appeared in 1914. In July of 1915 Boccioni enlisted in the army with Marinetti, Russolo, and Antonio Sant'Elia. He suffered an accident during cavalry exercises in Sorte near Verona, and died on August 17, 1916.